We offer a nutritious range of Red Lentil (Masur Dal), which is used for thickening purposes. Our organic red lentil is obtained from best farms and is available in packets of various sizes. Our products are highly demanded and appreciated by our esteemed customers across the globe. Last but not the least; we are reckoned as one of the famed split red lentil exporters from India. Our optimum quality Skinned and Split White Lentils (Urad Dal) is extensively used as a substitute of meat in various mouthwatering recipes. These split white lentil is easily available in the market and that too at the most competitive prices. Also, we are regarded as one of the chief skinned white lentil suppliers of India. 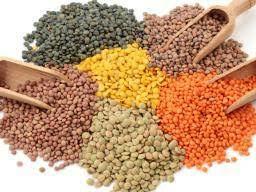 Our optimum quality Gram Lentil (Chana Dal) is highly demanded by our clients and is easily available in the market. Our gram lentil is further divided in two sub-categories black gram lentil and red gram lentil which are of prime quality. However, our products are available at the most competitive prices in the market and thus, we are regarded as one of the leading exporters of gram lentil from India.